Our pigs are a cross between Essex Saddleback and Duroc. Saddlebacks are very good at living outdoors - although they do have little huts, full of straw! We try to move our pigs onto a new patch of land every 6 months to break disease cycles - they leave the soil in a fabulous condition - it's like someone's spent hours forking it over and mixing in muck. Sows can have a lot of piglets - they farrow (give birth) twice a year, and our pigs usually manage to have a litter of between 8 and 12 piglets. We all know that piglets are incredibly cute and inquisitive - never more so than at about 2 weeks old - when they're teething. They'll have a go at biting everything, including our wellies when we get into the pen with them! They are fed on a mix of cereals (wheat, barley, oats) and beans and add minerals and molasses to make sure they're getting everything they need. Then, of course, they're always happy to finish off all the leftover vegetables from the farm, food shops and Tea-Rooms at Burwash Manor! 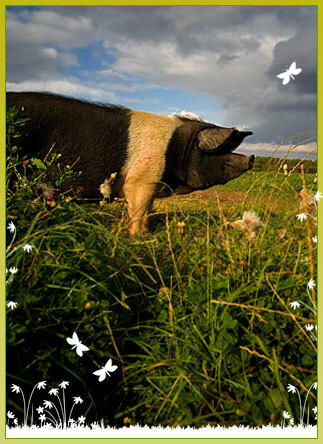 They have a lovely life, rooting, eating and sleeping, and therefore make the most succulent pork, sausages, bacon and ham which we sell only in The Larder at Burwash Manor.